PLASTGRIP® 2C-Polyurethane is a unique type of polyurethane. Ideal for the bonding/repair of plastic parts. Available as a 2-component, 1:1 ratio, in various curing speeds, and packages. 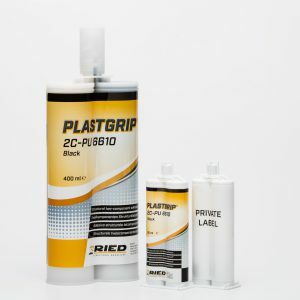 PLASTGRIP® 2C-Polyurethane is a unique system for the repair, bonding and sealing of plastics and many other materials. • 18 months shelf life. • Both high viscosity and fluid variants. • Excellent curing speed and strength of the bond. • Stays flexible even under cooler conditions. • Does not contain any solvents. • Excellent bond of many different substrates like plastics, metal, GRP, ceramics, SMC, wood, plasterboard, concrete, rock and marble. • Applicable in automotive and other industries where rapid curing is needed. • Structural or cosmetic repair of bumpers, spoilers, lamp housings, radiators, etc.